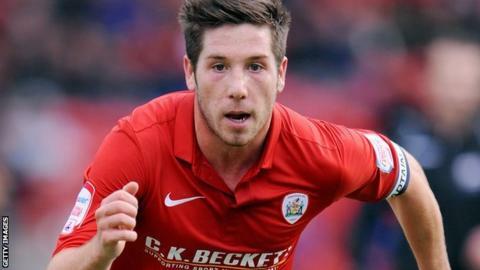 Norwich City have signed midfielder Jacob Butterfield from Championship side Barnsley on a four-year contract. The 22-year-old attracted interest from a number of Premier League clubs after a series of impressive performances for the Tykes at the start of last season. But he has not played a competitive match since suffering a serious knee injury against Leeds in December. Barnsley are entitled to compensation, even though he was out of contract, and the amount will be decided by tribunal. Manager Keith Hill, who hoped Butterfield would stay at Oakwell, is unhappy with the offer the Canaries have made for the player. "It seems ridiculous that they are going to try and get him for as little as they possibly can," he told BBC Radio Sheffield. "The initial offer is an absolute joke. It's scandalous, disrespectful to Barnsley as well as the management teams and his team-mates. "I'm disappointed with how the situation has lingered on and I would have liked business to have been concluded sooner than this." Despite his youth, Butterfield was given the Barnsley captaincy before the start of last season, having been used more as an impact substitute by previous boss Mark Robins. And he had just received his first England Under-21 call-up when he was injured in the Yorkshire derby game on New Year's Eve. He is the second signing by new Norwich boss Chris Hughton following the recruitment of former Rangers defender Steven Whittaker. Butterfield said he had received "a lot of offers" but was confident he had made the right decision. He told BBC Radio Sheffield: "It's obviously a massive club, very well supported and the manager showed real interest in me and made a real effort to persuade me to join Norwich. "It made it more complicated with the injury and because I missed so much football last season, it was important to get the right move where I'm going to play football because the last thing I want to do is miss any more time on the field." Butterfield, who had been offered a new contract by Barnsley, insisted he had always been straight with the Yorkshire club. "I've never lied throughout the whole six to nine months, however long this transfer saga has been going on. "I wanted to play in the Premier League and I had no intention of making a sideways move for more money," he added.